WhatsApp has introduced a bunch of new features to its mobile application over the course of time. Since the initial launch, WhatsApp as an application has evolved a lot over time. Recently we saw a bunch of new features which were added to the app through an update. The most used feature whichw as added recently has to be the video calling. Having the ability to initiate a voice or a video call in your messaging app comes really handy. Well, now it looks like the company has a lot in store for us in coming days. According to the new reports which we have, it looks like WhatsApp is working on a new feature altogether. With this new feature which is rumored to be called Live Location Tracking will allow you to track the location of your group members. 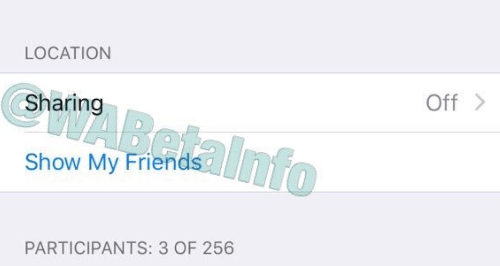 This new feature has been found on the beta builds of both Android and iOS i.e. version 2.16.399 and version 2.17.3.28 respectively. This is something new since live location tracking feature is not something that we have seen in WhatsApp before as far as groups are concerned. The Live Location tracking feature can be kept on for about a minute, 2 minutes or even indefinitely untill you wish you turn it off. While this is a new feature, we belive that it will really come in handy in some situation where you need to know the exact location of any of your group member. Now this might raise a lot of privacy concerns, however, do make a note that if you wish to stay away from this feature, then you can do so as well. If your live streaming is turned off, then no one will learn your location at any given moment. As of now, this live location feature is disabled and WhatsApp needs to enable it in order for everyone to be able to use it. Also, talking about other new features, we might also get some new features like Recall and Edit very soon. With the Recall feature, you will be able to recall a sent message as long as the recipient has not read it yet. Another feature called Edit also works similarly. Just as you can recall a sent message, edit will allow you to edit it as long as the recipient has not read it yet. These new feature will definitelt come in handy in most cases since many users were requesting for this. 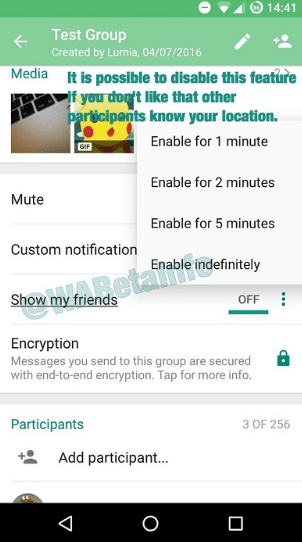 We are not sure as to when WhatsApp will make these features live for everyone. If you wish to know more about this feature, then we suggest you stay tuned to PhoneRadar for more details on the same.